Stellar company, spectacular quilts and an opportunity to shop make for a winning combination any day. We left early for Halifax which is a good 2-1/2 hour drive from Amherst. Naturally, it was raining when we arrived at the campus of Dalhousie University. 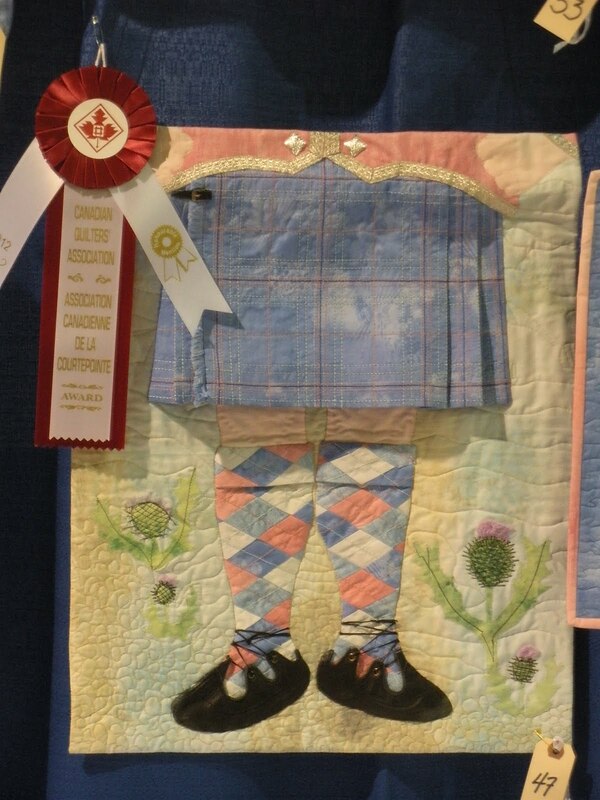 We eventually made it to the National Juried Show of Quilt Canada, being held at the Student Union Building. For some obscure reason, no pictures are allowed to be taken at this show, and I turned my flash off to be inconspicuous out in the hallway taking these. We were on a quest to see Monika Kinner-Whalen's beautiful prairie dress and we did...but the no-picture rule means we can't share it with you. While there, we met up with Linda H from Stitch Lines who I expect will have a spectacular batch of pictures of the week to share soon. The invitational show was just across the hall from the NJS. After enjoying the beautiful showing of quilts, we made our way to Dalplex to see the Trend Tex Challenge. This is a fun event in which to participate and it is so neat to see the different interpretations. We ran into Linda as soon as we arrived; check out her blog for lots more pictures. This one was adorable - see the stitched dimples on the knees? Then off to the Merchant's Mall! I checked out a Sew Ezi portable table for my Bernina (really tempting...) and got so distracted by all the goodies I neglected to turn my flash back on. Ergo,the pictures are fuzzy and dark. There were a good many vendors from away which gave wonderful variety. This is Stitches from Salt Spring, B.C. 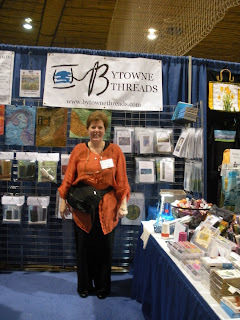 I picked up three spools of my favourite thread at The Quilting B and More from Charlottetown, PEI. My friend Kate from Kanata urged me bid hello to her friend Marilyn from Bytown Threads in Ottawa and I'm awfully glad she did. This very busy booth was stocked with Aurifil thread and I purchased some to try out. Marilyn graciously agreed to pose for a photo. 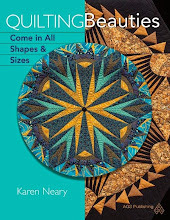 I circled the mall a couple of times before I got a chance to speak to Heather MacArthur, editor of Quilter's Connection. Heather is as delightful in person as she is in print and I am so pleased we had a chance to meet up. Written correspondence is one thing but it makes such a difference to hear a voice and see a face. Heather had copies of the latest issue of Quilter's Connection magazine with her, hot off the press. And speaking of seeing faces, I saw many I recognized including Gail and Jean who will be coming to our N.S. Fibre Arts Festival again in the fall. By this time our day in the city was over; we missed as much as we saw, but it was a long drive home. Kudos to all the vendors who come from so far away to be part of these shows as they must surely return home exhausted. Kudos also to Lesley and Lynn, who make for such terrific travelling companions. 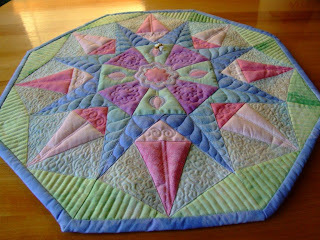 I am off today to Quilt Canada to see this gorgeous creation by my friend Moniker Kinner -Whalen in person. Monika's Prairie Dress is part of the National Juried Show which opens today in Halifax, N.S. I can't wait to see it! The buzz in Maritime quilt circles this week is the opening of Quilt Canada in Halifax. Despite big plans to go spend the week, enter a quilt in every show and attend all the classes (!) life didn't quite work out that way and my only entry this year is in the Trend Tex Challenge. I hope to at least have a quick trip to the city to see this show. I've been doing this challenge for many years now and each time try to use a technique I haven't done before.This very pale, watery fabric was a bit of a shock to someone like me who normally gravitates towards bright, happy colours. I showed the back of the quilt earlier but with the show opening tomorrow, I think it's safe to flip it over and show the front now. The theme was "At Home In My Garden By The Sea." Oh my... With only 5 fabrics, all very close in value, I settled on alternating the pink and blues for the sailboats and water to add a little interest. The sailboats are encircling a garden oasis which (of course!) features a bee in her garden. My "new" technique to try this year is raw edge applique. I can honestly say, it isn't my thing. The little wallhanging quilted up very nicely and I am pleased with how it turned out. The Trend Tex Challenge Show is at Dalplex, and open Wed. - Sat. Hours- Wed. and Thurs. 9-5, Fri. 9-8, Sat. 9-5. Admission is free. The string quilt is moving along at top speed, and enough blocks are completed that I can start to play with the layout. So far this star for the centre appeals to me. Right on cue, as soon as the picture is taken, Polly gives a flying leap and lands on the blocks. Perhaps she doesn't like the layout as much as I do? It's time to start my fourth and final dorm quilt. 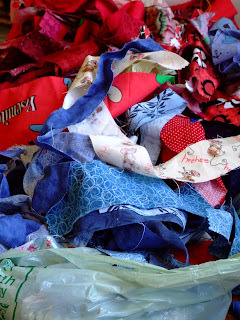 Last year when my youngest and his friends were heading off in different directions to university, I struck on the notion of making each a quilt in their chosen school colours. Polly was newly arrived in our household and my son's was the first quilt she helped construct. She's now been with us one full year, having shown up on the Victoria Day long weekend, which has just passed. It makes me smile to see how small she is in this picture! 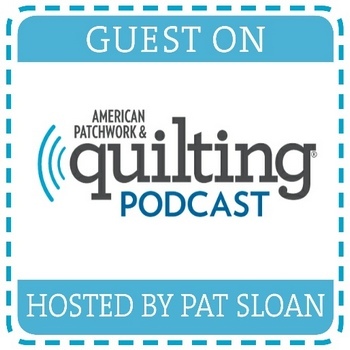 The last quilt is for a friend of my son finishing high school this year and I've had my listening ears on to discreetly learn where he is heading in the fall (trying to keep a bit of surprise in this!) The first quilt (shown above with Polly) was a Log Cabin (you can see pictures here), and subsequent quilts have been made with the "strings" leftover from that quilt...with extra colours added as needed. The first one is here, and the second one is here. The colours of this last school are red and blue. As before, I begin with pages from an old telephone book to use as foundation. This looks like a whack of fabric but in truth...it isn't and it may be a stretch to get enough for the quilt. Construction is a simple stitch and flip technique. (Almost) 3 blocks done, 45to go! 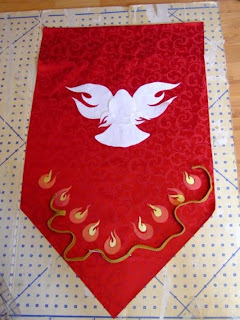 Today is Pentecost, and the hanging of the 4th in a series of paraments commissioned by a local church. Even though this one looks simple and straightforward, it was not without challenges. 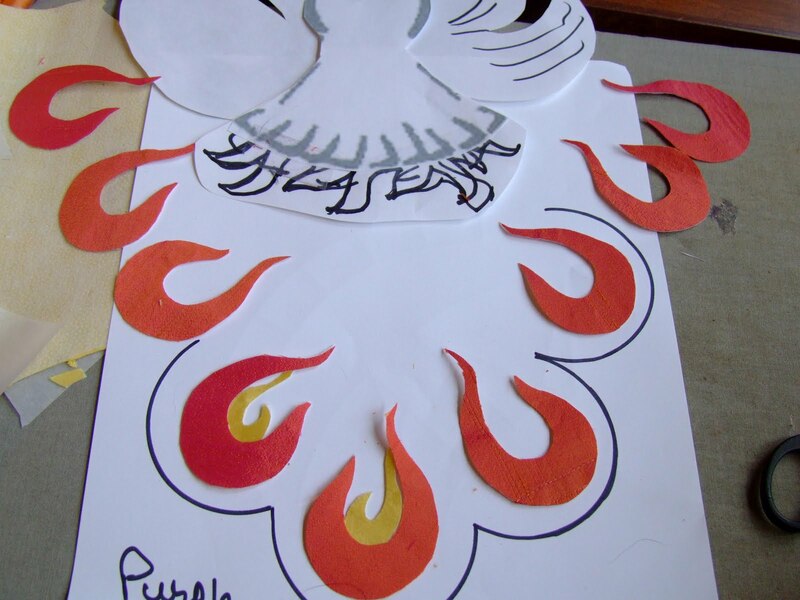 My original design idea was to use the same flame shape for the tongues of fire as well as for the wings on the dove. Back to the drawing board. Luckily, I had enough of the red background to begin from scratch...but no more of the shot orange/red silk for the flames. I stuck with the original layout and began cutting more flames. I used the lid of a spray starch can to draw semi-circles and made a template of freezer paper. Luckily the freezer paper had not been tossed so it was a quick job to mark the flame placement on the new antependium. Clover fusible bias tape worked wonderfully to outline the circles. It was edge-stitched using gold metallic thread. The flames were satin stitched with an orange-red Sulky which gave them a bit of sheen. A pretty beaded tassel finishes the bottom point. Each of the paraments so far has had a different bottom shape - rounded, squared, scalloped and pointed - to give variety and interest to the various hangings. I like how the dove is gently descending into the flames, rather than dive-bombing head first as we often see. 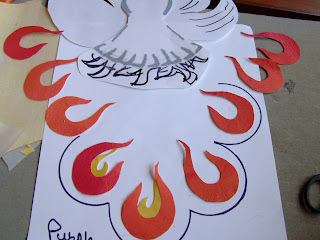 Simple, but effective in communicating the message of Pentecost. The beautiful,brand new website for the Nova Scotia Fibre Arts Festival is up and the schedule of events is now posted. As it is the 5th anniversary of the festival, all kinds of special events are planned. For my part, I will be offering a one day workshop on my Roundabout Again design. The green silk antependium was dedicated yesterday, marking a period of "Ordinary Time" in the liturgical season. It is a joyful tree of life with heart-shaped leaves arranged in a double circle around uplifted branches. The appliques are made of various weaves of silk including dupioni, hatabai and noile, on a dupioni silk background. A gold fringe complements the scalloped bottom edge. I had shownbits and pieces during the construction process . 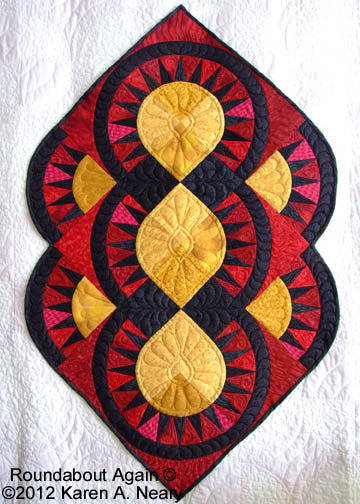 I decided to shape the bottom in a gentle scalloped wave which dips below the quilted alpha/omega symbol. The piece is backed with the same green dupioni silk which was placed right sides together and turned through the top edge. This edge is then overcast and a casing is stitched for the hanging rod. This allows a clean, finished seam on the bottom (no binding). On this scalloped edge, I will add a gold fringe. When you purchase fringe, it comes with a line of chain stitching across the bottom which pulls out really easily. Many, many, (many!) years when I purchased fringe for the first time I recall being puzzled by this stitching and told the clerk no, I wanted the fringe that moved freely not one that was sewn together. She laughed and told me that the fringe comes stitched on the bottom so it stays untangled on the bolt but you take that stitching off at home. I took her at her word and immediately removed the chain stitches when I got home. Bad move. That chain stitching makes it so much easier to apply the fringe if you leave it in place during stitching and remove it afterwards. Lesson learned from experience. Having said that...this gold fringe has been in my stash for some time, and the stitching had come off on its own. You can see it makes for slower going, as it's really easy to catch the individual strands under the needle. The fringe can be applied by enclosing it in a seam (like piping) but my favourite way is to simply topstitch it in place. I begin by turning under about 1/4" on the end of the fringe and place it on the BACK of the work, about 1" from the end. 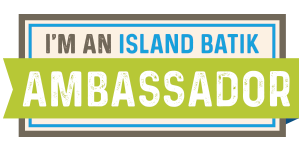 (This way the join doesn't end up on the front.) I stitch this small bit of fringe to the corner, clip my threads and then begin pinning the fringe to the front. The pins are placed lengthwise along the braid. This holds the fringe more securely than placing pins crosswise as we normally do. My thread colour is matched top and bottom to the colour of the fringe and doesn't show. I begin stitching, removing the pins as I come to them. I stitch right up to the end, break my stitching, and clip the threads immediately. It's easy to lose those threads in the fringe if you don't take them out at the time and you won't find them again until the piece is hanging on display (!). Flip the piece over to the back, and repeat the process. When you get to the end, stitch past where you started (so that you don't have a lump in one spot) and cut the end of the fringe allowing about 1/4" extra. Turn edge under and topstitch. The join will not be obvious. It makes for a nice, traditional finish for the antependium - one often seen on church paraments.